If you have been around CodeKarate.com for awhile you have noticed that our branding has been, well inconsistent. In less than a year, we have managed to swap in and out three different logos. Each logo I suppose tells a story of Code Karate and played an important role in getting Code Karate to where it is today. As we embark on what we believe to be a turning point in Code Karate we wanted to share with you our old logos and show off our new logo. Going back to 2010 we get to see our first logo. Logo designers I am sure are jealous of this work of branding art. Here's the truth, at best we are novice graphic designers and this is the work of that title. As a simple touch to Code Karate's genre we added the coding brackets around the name (aren't we clever). As I am writing this I am thinking to myself, why did you choose that color?. Honestly, I have no idea, but it could have been A LOT better. Regardless of my color choices, this logo stuck around for awhile and greeted thousands of Code Karate visitors. 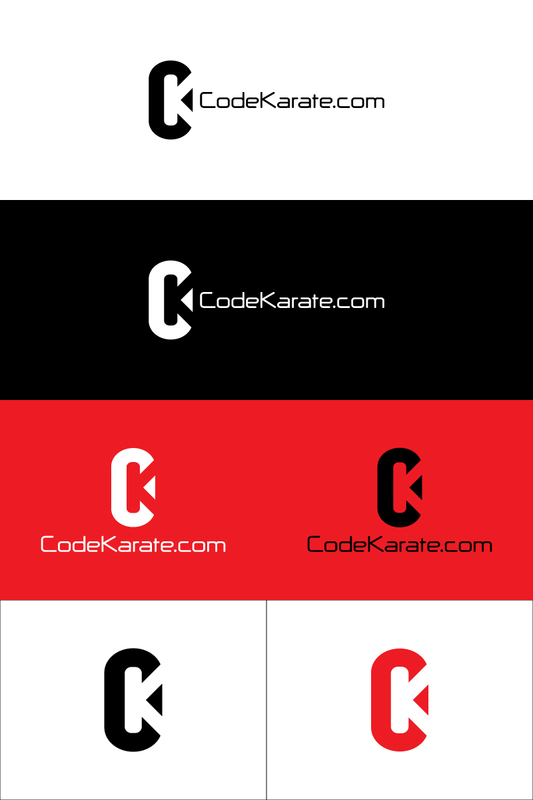 Introducing Code Karate Logo 2.0! If there ever was a logo that missed its mark I believe I nailed it. Here is an important note about marketing. When you are going to introduce something effecting your brand to a large audience take the time and ask colleagues and others if they think it is a good idea. If the brand misses the mark with them it is a great sign to rethink what you are about to put forward. I wish I would have taken this advice. For our current logo, we finally took some advice and had an actual graphic designer create our logo. To get the logo created we used 99 Designs and there pool of designers. We have used this service before in the past for other projects and have had great success. This campaigned in our opinion proved to deliver as well. In total we have around 80 entries, some looked like we designed them and others (like our current logo) just stood above the rest. Choosing a logo is a surprisingly tough decision, especially when you have multiple that you think would work. Ultimately, this is why we choose this logo. Here is a look at other variations of our logo. I think for foreseeable future this logo will be the brand for Code Karate. Let us know your thoughts about the logo. Unlike before we are listening to our audience.